The Ozarks are blessed with dozens of man made reservoirs with clean water, healthy fish and easy access. All of them are fantastic for kayaking. We personally find the quieter areas of the lakes to be more relaxing and more our style. Incidentally on both Stockton and Truman lakes the Corps of Engineers maintains a perimeter of land around the lake which means these lakes are less developed and perhaps a bit less trafficked. Don’t rule out smaller lakes, either. Springfield has two smaller lakes, Lake Springfield and Fellows Lake that are used for water and power supply that are quite nice for a few hours’ float. Check for posted regulations, though. We got caught out at Fellows Lake when we didn’t realize that kayaks did, in fact, need a paid sticker ($35 per boat per year – 2012). We thought we were exempt. So far we’ve listed all the Lakes in the Ozarks – Missouri and Arkansas and provided links. We’ll be adding rivers and creeks later. Places to go, gear, trip reports. As we get out and about we’re adding posts on what we’re doing in our kayaks. Explore our Paddling Gear section to see how we’ve customized our kayaks and gear suitable for paddling in the Ozarks. 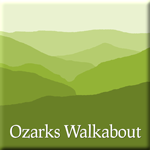 In the Ozarks, there are many lakes ans waterways available for recreation. Here are some general resources and other links you may find useful.